My favorite thing to buy every time I go shopping are new makeup products. I have a huge bag filled with things I still have yet to try! There's always the question of how much you should spend on makeup products and I definitely believe that 9 times out of 10, the more expensive products have better quality. But there are still a ton of products that don't break the bank and are way better quality than you would expect; especially when it comes to drugstore shopping. 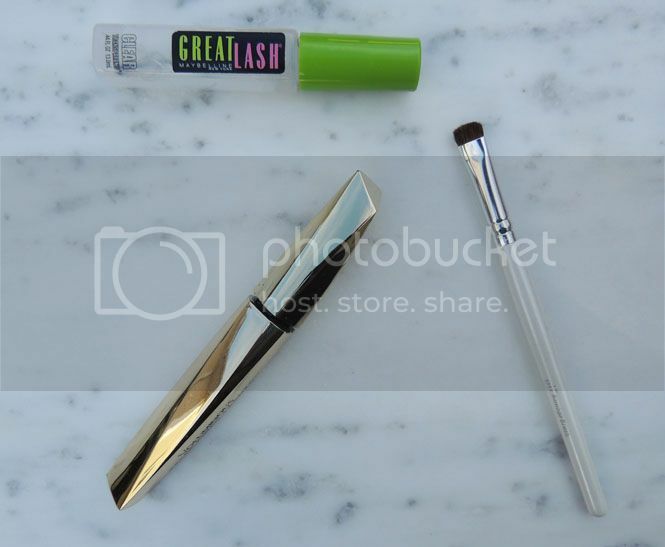 Maybelline Great Lash Clear Mascara: my life was changed when I tried this a few years ago! I use it every day and the brush is perfect for your lashes and brows. It helps separate your lashes before applying mascara and helps keep your eyebrows in tip top shape all day long. The Great Lash Mascara has been around for years - my mom has used it since she started wearing makeup! I've seen a ton of brands try out the clear mascara and out of the ones I've tried, I always go back to this one. L'Oreal Voluminous False Fiber Lash Mascara: ever since fiber lashes have become popular, I've been trying out a few different ones because the idea of it makes so much sense, doesn't it? I tried this Physician's Formula one and the Tarte Faux Lash extenders and still love my L'Oreal mascara best! It comes in a few different colors and it lasts a long time too. I use the "very black" version and I see such a difference in my lashes. I do like the idea of the separate tube of fibers like the Physician's Formula and Tarte ones have, but I wear contacts every day and I get so paranoid about one of the fibers going into my eye(s). I usually wear this L'Oreal mascara every day, or I combine it with this MAC mascara. ELF Eye Shadow Brush: most eye shadow palettes come with brushes, but I swear by the variety of brushes that Elf Cosmetics sells! Every time I go to Target I end up buying a few brushes because I can't help myself - I mean they're like $2! I have a handful of MAC and Sephora brushes I love to use but Elf never fails to disappoint. This eye shadow brush is super easy to clean and applies your shadow evenly and perfectly each time. Highly recommend! 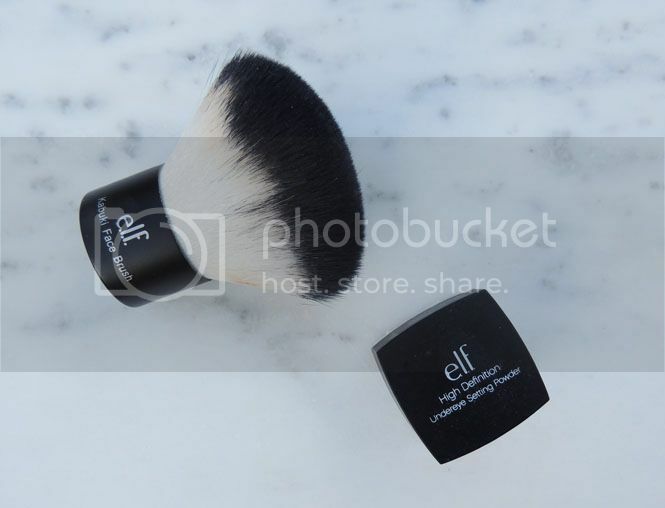 ELF Kabuki Brush: the struggle in finding a perfect kabuki brush is REAL! I've tried this Sigma Beauty brush and this Bare Minerals brush and neither are as soft or help apply makeup as evenly as this Elf one does! I talked all about how I use it with my NARS Velvet Matte Skin Tint over in this post if you want to check it out! ELF Undereye Setting Powder: this is by FAR my favorite beauty product I've ever bought that is under $10!! Seriously, do not go and spend $38 on setting powders like this Laura Mercier one; I love Laura Mercier makeup but this ELF powder is perfection! It comes with a little brush for application too. I apply it as the last step of my makeup routine and put four spots of it under each eye. I blend it into my skin with the applicator and just like that my eye liner lasts ALL day! It doesn't smudge, get stuck in the crease of my eyes or start to look bad. I love this and I've been using the same little jar for months now - it lasts so long! ELF Zit Zapper: I know, another Elf product - but I swear this isn't sponsored haha! I love this stuff - it's basically just salicylic acid but also has aloe and tea tree oil which is great for your skin. The best part is it really works in such a short amount of time too! It's great because it's easy to travel around with and put in your bag to take with you anywhere. eos Lip Balm: this is pretty straight forward but it's by far one of my favorite lip balm's! This is another product that's so easy to carry around and it works wonders on my lips - especially at night! Covergirl Plumpify BlastPro Mascara: I got this mascara in my Covergirl VoxBox and I've been using it ever since! I love this mascara and not to be punny, but it gives my lashes so much plump! Covergirl Oh Sugar Lipstick: never have I tried a lipstick that I loved (under $10) as much as this one! It appears shiny and finishes with somewhat of a matte look and it comes in a ton of shades. I love the way it feels on my lips and it lasts really, really long! ELF Poreless Face Primer: this isn't the primer I use every day, but since I bought it it's been great - especially as my not-everyday primer. It's meant to reduce the redness which I always try to do before applying face makeup. It also helps to reduce the size/visible size of your pores which is why I love it the most! Best of all, it doesn't leave my face feeling sticky even though it's gel. No matter what kind of makeup you buy, looking for the quality of a product is always the way to go. I love makeup shopping - whether it's at Sephora or CVS, there's always great products that you can find under $10! What are your favorite makeup products under $10? 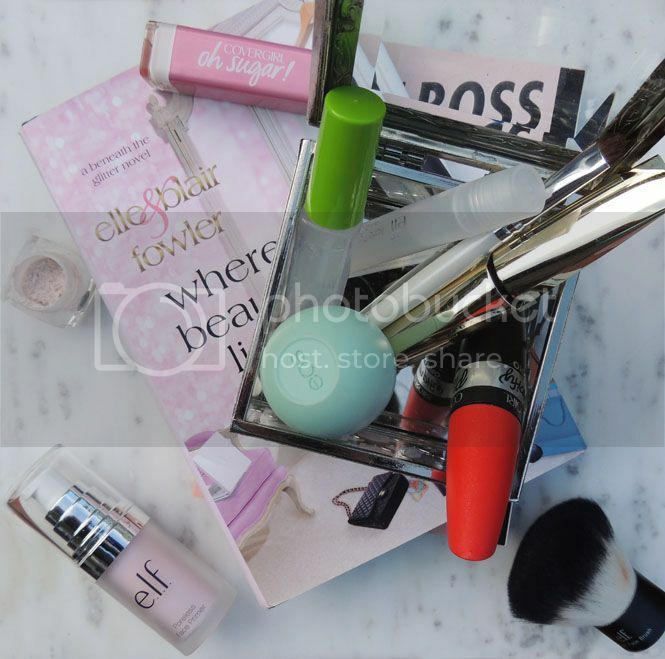 Ohh that ELF brush looks amazing! I'm all about affordable beauty products! That ELF kabuki brush looks awesome. I don't wear a ton of makeup most days, but I do like to primp on the weekends. Will definitely check these out! I use the ELF under eye powder too and it's honestly great for what you're paying. Such a steal! I've been a sucker for ELF products and for the price, those brushed cannot be beat. I absolutely love them. Great list! I love EOS! I think i need to give ELF a chance, I keep hearing great things about ELF, and anything I can pick up at target it perfect. The CoverGirl Oh Sugar! and EOS are always in my make up bag. I love them both so much. I may need to try the ELF Kabuki brush! These look like some great products for beginners on a budget while building up a collection! Nothing beats inexpensive drug store finds! I need to try that clear mascara! ELF makes some of my favorite brushes. I have several in my collection, and I'm never disappointed with their quality. Do they have E.L.F. products in Canada? I have heard of it but don't know if I've seen it at our pharmacy. These are all great picks! I'm definitely going to try the maybeline clear mascara now! Love all things drugstores! ELF brushes are so good. I want to buy the Wet'n Wild new brushes but they're sold out. I love ELF! The products are such great quality to be so cheap! I have a handful of ELF brushes & they are my favs. I don't wear a lot of make-up just an eye liner and a lippie, and I always look out for good deals on those. I love these brands, especially ELF! the L'Oreal Voluminous False Fiber Lash Mascara is one of my FAVORITE drugstore mascaras! It's seriously so good! I need to go pick up a new tube, I've been out for a while! 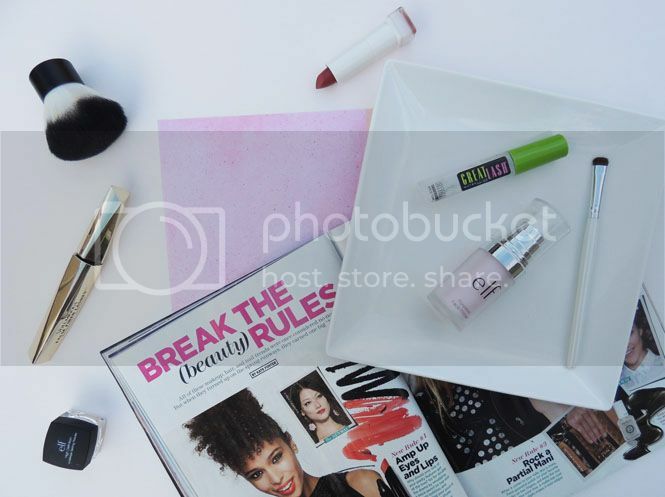 These are great drugstore finds!! I love ELF products, they are pretty fantastic!! I loved a lot dealing in a beauty products especially the way I can save money for myself.. Such a great deal. Thanks for sharing. Definitely a steal for their price. Looks like they are all great products from a good brand! I love elf products and the kabuki brush was look perfect. Cheap but still sounds like a great product! I will check that out. 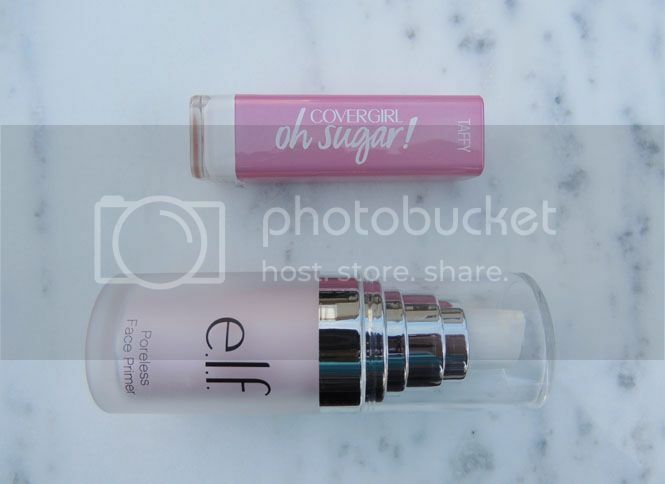 I love elf products - aside from the fact that they are inexpensive, most of them are AWESOME! What is your favorite mascara ever? I am trying to find a new one desperately!! I use an ELF powder too, but it's not strictly for undereye. I love it though! I am going to try that clear mascara now. I LOVE ELF brushes, they come in so many awesome varieties and the quality is always impeccable! Their studio brushes are some of my all time favs! I am not much of a make up person but I would definitely need a new brush right now. My daughter and my niece love using make up and I know they would go crazy over these products. The Oh Sugar lipstick is interesting. I love how they design its case as well. I have heard RAVE reviews about the Oh Sugar! lipsticks, so now I obviously need to pick up...20. Also Elf is such a winner. Rarely am I disappointed by their goodies! 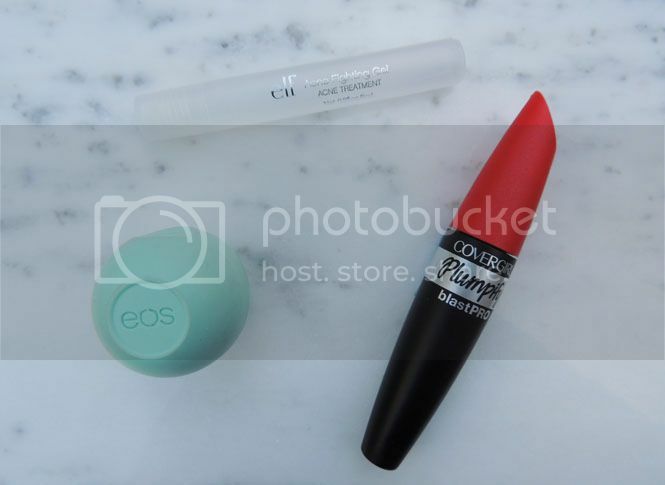 I love Elf and EOS lip balm! I wish I ccan also try the other products..
ELF is a great brand. They have so many great affordable products. I love them for my girls too. Beauty products are the need of every women but due to their cost we are not able to afford that beauty products. That's why I loved the collection by ELF. All the beauty products are usable and we cannot left any one of these. I love this brand, would like to use their beauty products. Such a nice collection under $10. Women always attract on those beauty product that has low cost. But these products are good to use.